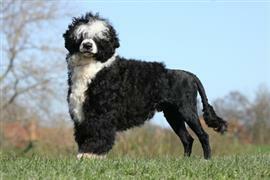 The Portuguese Water Dog originated in Portugal as a working dog for fisherman. The breed was often trained to herd fish into nets. In keeping with this history, owners often elect a name related to fishing or fish in general. Popular fishing related names include Tackle, Caster, and Hook. Another great idea is to name your puppy after a local river (according to Portuguese custom, this will provide protection from the spirit of the river). Because the breed was commonly taken out on boats, seafaring names like Sailor, Skipper, or Schooner are typical. The breed is often referred to as Cao de Agua in Portugal which means ‘water dog’. Stormy, Splash, and Agua are some water related name options. Other names can be taken from famous Portuguese explorers such as Vasco (after Vasco da Gama) and Magellan (after Ferdinand Magellan). Some of our pages will contain a subcategory. A subcategory is a slightly more specific grouping than the main topic of the page. For a subcategory, we will include a separated table of names and corresponding descriptions. An example of a subcategory of Red Dog Names would be 'Dog Names Inspired by Red Wines'. If you have any subcategory ideas for the Portuguese Water Dog Names page, we would love to hear them. Use the form below to submit your ideas.